Visual Studio Code>Other>Open Files (Beta)New to Visual Studio Code? Get it now. A powerful alternative to the Open Editors widget. Showing sorted and grouped open files. 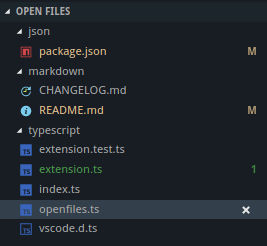 One day I got tired of dealing with the mess that is the Open Editors widget in vscode, so I decided to do something about it. The result is this extension, which is really the same thing as Open Editors with the addition of sorted and grouped files. There is a refresh option (under the widget navbar) to manually refresh the list of open files. Otherwise just switching to a file will make it appear. Splits are not tracked very well, or in some cases at all. This is a limitation in the vscode extension API, I have yet to find a workaround. When switching tabs the onDidChangeActiveTextEditor event is called before onDidCloseTextDocument. When closing a tab it's the inverse. Use this information to infer whether a tab was closed or just switched.